Clint and I just hit our one-year wedding anniversary on November 12th, so I thought this would be a great time to walk down memory lane! 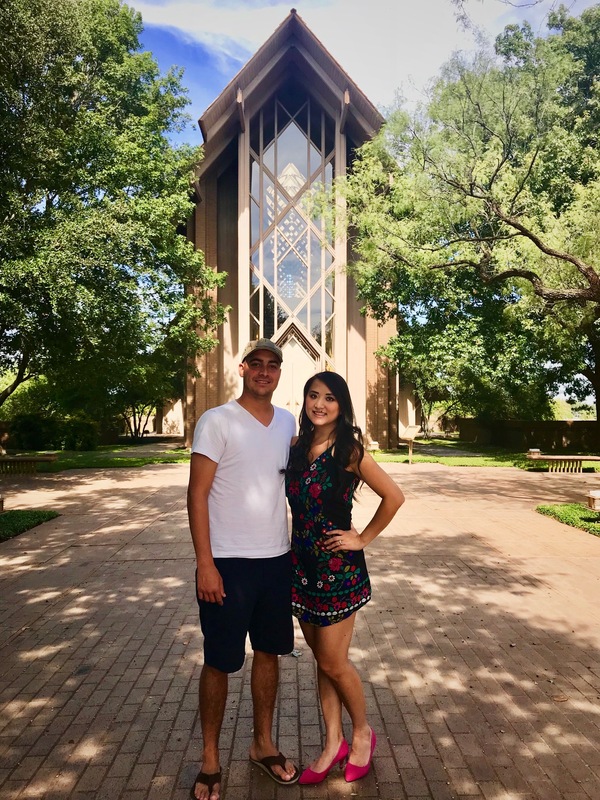 Though we got engaged in 2013, we were still living in Japan and trying to plan a wedding that would take place in Dallas, TX – difficult is an understatement. I’d never been one to think about a wedding, so I had to start plans from scratch. It took many nights of Pinterest boarding and inspirations from friends and family to get to the final day! We at least had a theme (astronomy) and colors (midnight blue, blush and hints of gold). I’d been eyeing the Marty Leonard Chapel for a long time. They were booked for our original date, but worked out for the new one. Glass walls are my dreams come true. Although the original plan was to host a fairly large wedding (well, large for Caucasian families and average for Vietnamese families, I learned) for 200 guests, we learned Clint was going to deploy in January 2018; so we had to push it up and scale it down to 75. We may have lost some friends through this down-scaling. We were lucky to find Fearing’s at the Ritz Carlton was available, but they’d only be able to host 60. It was going to be a tight squeeze! As an amateur baker, cakes are almost an obsession for me. I knew the wedding cake had to taste good and meet the two design criteria: astronomy-inspired and understatedly dramatic florals. We went for the requisite tasting and Butch, the baker from Delicious Cakes, drew up a plan: a three-layer cake, each with its own flavor (orange marmalade, fresh strawberry and raspberry liqueur). What do you think of the final product? It wouldn’t be a Kim Do wedding without some DOnuts, would it? The moment I saw Sweet Daze‘s galaxy donuts on Instagram, I knew we’d have to feature them at our wedding. I mean, look at how fun they are! You can’t hand a graphic designer a wedding and not expect some custom prints! I had a lot of fun designing different pieces: from invitations, signage and even our very own Snapchat geo-filter! Though this wedding was small, I wanted the various aspects to captivate the imagination. When Clint’s dad commented on how he loved all the details in the wedding, it was the best compliment I could’ve received. All the hard work paid off! My younger sister, Jane Do, was the maid of honor; which meant one of her biggest tasks was to plan a bridal shower. And though I’d fired and rehired her (in jest) as the MoH many times throughout the pre-wedding period, she really came through with a magnificent tea party at the Four Seasons Resort in Las Colinas. It was truly a sweet day with my Bà Ngoại (grandma), mom, sisters and closest gal pals. To commemorate our years in Japan, we wanted our family to get together for sushi. Sushi Axiom was a great spot, and delivered tasty dishes that catered to both the Asian and American palate. We discovered a few family members from Clint’s side had never had sushi before, and ended up liking it. Win! My gracious older siblings offered an afternoon of pampering by way of manicures and pedicures – even Clint got a treatment! Look how cute my older sister, Tyty, was with her constellation toes. Even cuter is my brother taking his time to perfect my nails. I also elected to get lash extensions for the first time. They’re sooooo pretty, but takes a lot of effort to maintain. Still glad I didn’t have to deal with the glue-on ones though. Lucky me, a great childhood friend has a side bridal makeup and hair business. She offered her hair services to me and the bridal team gratis! She also recruited her partner to do our makeup. My dress was the Essence of Australia Gatsby-inspired Illusion Back from Circle Park Bridal Boutique. Only for this occasion, I spoiled myself with a pair of gold Jimmy Choo Romy heels. 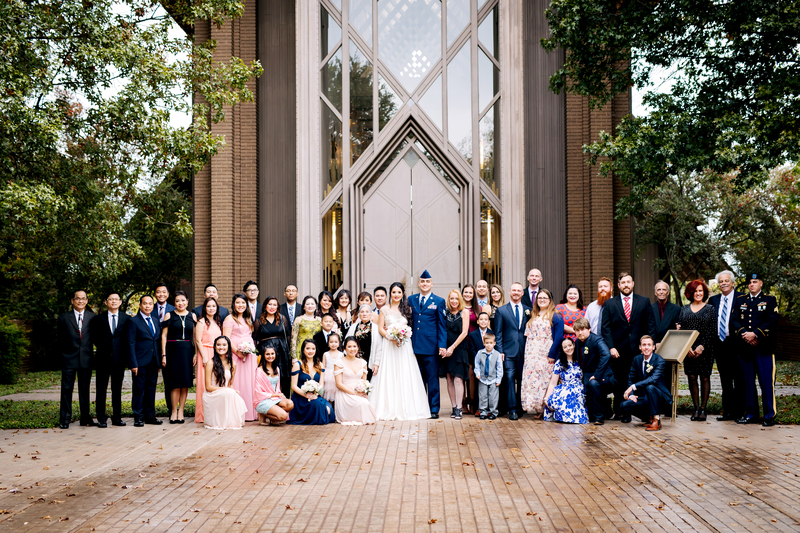 The bridal party all wore varying shades of blush, while the MoH opted for a navy. And here are shots of the guys getting ready. One of the best things about Clint is how he always makes me feel like I’m the prettiest girl in the room. It was no different during our First Look. Even when I’m critical of details, he was blown away and you can see it all in his face. Everyone’s right, your wedding day goes by so quickly! The reception zoomed by especially fast. We introduced the wedding party to various Chromeo songs. My dad gave a bilingual speech that was adorable! Jane and Minh Thu gave endearing speeches with tears and laughter. There were even games! So much love all around, it’s hard to come down from that high. We made it through our first year of REAL marriage unscathed!